New Barnsley boss Jose Morais has said he is "more than a coach" after signing an 18-month deal at Oakwell. 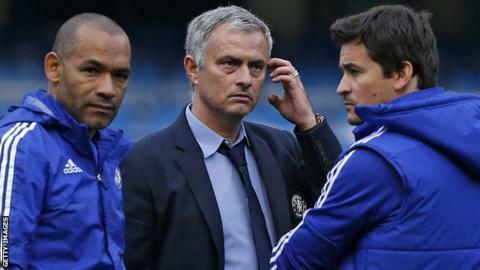 Morais, who worked under Jose Mourinho as a coach at Chelsea, Inter Milan and Real Madrid, was named as Paul Heckingbottom's successor on Friday. The 52-year-old's previous role at AEK Athens ended after 16 games in charge. "My way to live is challenging myself and challenging others to achieve what people think is possible and much more," he told BBC Radio Sheffield. "That's why I decided Barnsley, because they are in a situation where I think the team needs help, the team needs to improve, the team needs to make things better." Morais has had spells in charge of clubs in Saudi Arabia, Tunisia and Turkey in addition to his unsuccessful time in Greece. "I would say that I am more than a coach, I am a leader," he said. "I'm a coach with vision about not only a way to play, but a way to live and a way to believe and a way to make things greater, bigger, better. That's the coach I am." Barnsley are 22nd in the Championship table, one point adrift of safety.